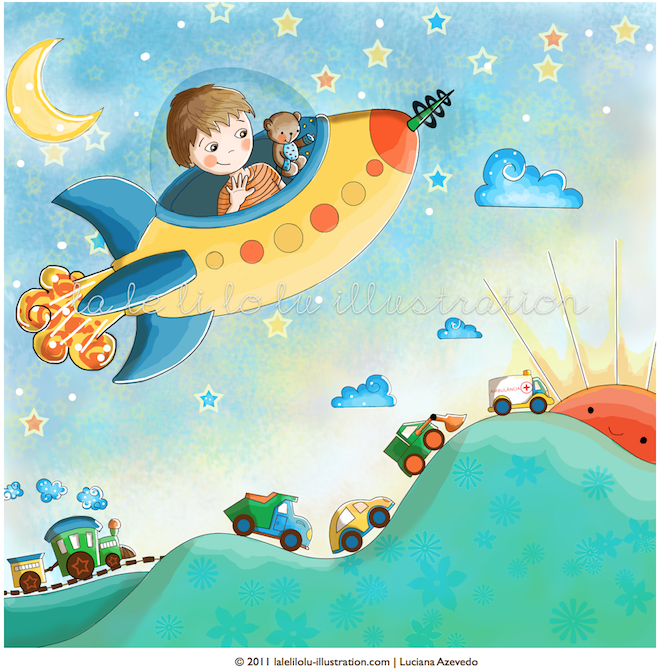 A while ago I published this illustration I created especially for my son’s bedroom wall. My intention was to test the color combinations first, but when I got to his room armed with paints and brushes, I decided to keep it simple and use basically the three main colors that were already there – blue, green and orange. Then I used glowing star stickers for the stars and a lamp for the moon (which by the way, has a cable I still have to hide!). The result is above. In the last picture you can see Rafael, my husband, playing his acoustic guitar for Nicolas just before bedtime and on his right, the three prints I did for Nic’s second birthday, which are framed now. Luuu! Ficou tão lindo!! Sou muito fã do seu trabalho! OLha, vou fazer umas fotos de Leti no sábado, dia 12. Marina, vou estar esperando as fotos com ansiedade! Eeeehh!! Lúdico, colorido, alegre, enfim, o máximo! E aquele trenzinho com o nome dele? Que quarto mais fofo, pra combinar com um dono fofucho!! amei esse cantinho,parabens pelas artes!!! PS. Estou te seguindo, seu blog é uma graça.